Cooper carefully cuts off the observed-temperature trend line just at the peak, concealing the inconvenient truth that in the past two months global temperatures have plummeted as the el Niño comes to an end. Does he know that the chart is showing annual average temperatures? Does he know that the latest year for annual temperatures was last year, 2015? Why would it include the "past two months" temperature on an annual chart? As for cutting off at the peak, well it's more likely that this year, 2016, will be the "peak" for the next couple of years. Does Christopher know that the "past two months" aren't out for any of the above anyway. GISTemp hasn't released June data, and neither have any of the others as far as I know. The latest records show GISTemp with the latest of its two months as the hottest on record: the hottest April on record and the hottest May on record, while HadCRUT4 had May the second hottest on record, after May 2015. For GISTemp, every month from last October onwards was the hottest month on record for that month. No Clim-Comm piece would be complete without the usual catalogue of lurid supposed disasters: “Coral bleaching has reached epidemic proportions” (well, that natural defense mechanism happens whenever there is a severe el Niño, such as 1998 or two further great El Niños before that over the past 300 years, and the corals survive it just fine: they’ve faced a lot worse in the past 175 million years). I don't know where Christopher gets his odd notions from. Dying isn't generally regarded as a natural defense mechanism. Today's coral reefs haven't been around for anything like 175 million years although their ancestors formed millions of years ago. Most of today's coral reefs have emerged in just the last few thousand years. Christopher couldn't give a damn that we're killing off corals, some of which could have lived for hundreds of years. How, then, has the scare been maintained for so long? The chief reason is that the climate extremists readopted an unpleasant tactic first developed by the totalitarians of the 20th century: organized, paid, structured vilification of anyone who dared to oppose them. In the end, though, the world won’t warm at anything like the predicted rate. By the time even the extremists have realized that scientifically illiterate pieces like Cooper’s can no longer sweep the growing discrepancy under the carpet, how many tens of millions will their cruel policies of opposing affordable electric power have killed in third-world countries? We'll have to wait and see. So far the world is warming at the predicted rate as Figure 1 above shows. a bit too kooky for the more cosmopolitan brand of conservative. You can't espouse conspiracy derp and be taken seriously in high society. It's not too kooky for deniers at WUWT though, which i why they aren't taken seriously in high society. an unpleasant tactic first developed by the totalitarians of the 20th century: organized, paid, structured vilification of anyone who dared to oppose them. Anthony takes a dim view of academics, particularly academics who point out the obvious. What's new? Anthony regards the accurate "marxist's everywhere" as an insult, but doesn't regard his fans labeling people marxist (or communists) as an insult. Anthony approves of all the insults piled on benben by WUWT fans, but takes it as an insult that benben has the temerity to stand up for himself or herself, and for science. The article that Christopher didn't like was framed as conservatives running out of excuses to claim that climate science is a hoax. Most of the WUWT comments were about how everyone except science deniers are communists or worse. Fake sceptics are almost all right wing extremists who think that 90% of the world is out to get them. Oh dear. WUWT and it’s ridiculous obsession with seeing Marxists everywhere. McCarthy would be proud. McCarthy was correct. The US Government and academia were riddled with active, conscious agents of mass murdering Marxism. BenBen, your statement is ridiculous. WUWT does not see Marxists everywhere. There are people posting comments who believe government and bureaucracies are inefficient and thus making government and bureaucracies bigger will lead to more inefficiencies and thus more taxes, less growth, smaller middle class, and more poor. The only way Warmunists can avoid see marxists is by not using mirrors. If the 2016 data to date is averaged and added to the graph, the red line would run straight up to 1.15 ℃. Lol... imagine his squealing if they had done that. If they had done that he'd be squealing about using a partial year in the data. There's no way to win when it comes to TVMOB. Interestingly the original article pointed all this out. Our potty peer simply assumed no denier would read the source, I guess. The odds are always in his favour on that score (WUWT-ers are fake sceptics). In this case he gave himself an extra edge by not providing any link to the article. "As the discrepancy between prediction and observation continues to widen beyond all hope of concealment by further data-tampering, it will eventually become impossible to bury the now well-established scientific truth that, even though CO2 emissions are above the business-as-usual forecast made by the IPCC in 1990, the rate of global warming is a small fraction of what had then been predicted. BAU was 'Scenario A', which had concentrations and forcings (emissions being the wrong measure) considerably higher than actually transpired. Actual forcings actually turned out closer to Scenarios B&C. "However, Scenario A was its business-as-usual scenario, and it had incorrectly predicted a far greater rate of forcing, and hence of temperature change, than actually occurred." - Lord Monkton, here at WUWT. So what were the IPCC's projections under what turned out to be the more realistic scenarios? "Under the other IPCC emission scenarios which assume progressively increasing levels of controls, average rates of increase in global mean temperature over the next century are estimated to be about 0 2°C per decade (Scenario B), just above 0 1°C per decade (Scenario C) and about 0.1 °C per decade (Scenario D) "
Our author is well aware of this and should be ashamed of himself. But he won’t be." He says, “You should never hang an entire view of a chart on the last few data points” – and then hangs his entire view of the following chart on the last few data points, which show a spike in global warming caused by the more than usually active but now declining el Niño. As Sou notes, either Lord Numnuts confused monthly temperature anomalies with annual ones, or he thinks El Niño episodes last several years. 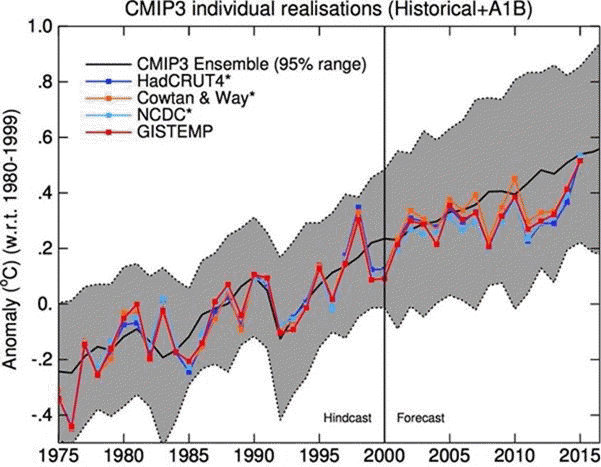 As for the WUWT commentariat's reaction to the plot of CMIP3 ensembles and observed temperature anomalies, with 121 comments in when I looked, just one (1) mentioned it, and only with generic denier bluster. "I love the hindcast period. Shucks, I could do as good or job with the assumption that the AMO is going to go up for the next 36 years in a somewhat sinusoidal pattern"
"... it's more likely that this year, 2016, will be the "peak" for the next couple of years." Indeed. Whilst it's likely to come down over the rest of the year, the current WMO anomaly (average of HadCRUT, GISS and NCDC) for 2016 to May is +0.77C against the 1980-99 base used in the annual comparison chart. Even with cooler temperatures expected over the remainder of the year, you'd still expect 2016 to finish well above the model ensemble mean. The guys commenting at moyhu are generally predicting GISS will end up with a 2016 mean anomaly above 1.0 ℃. So yeah, I suspect Monckton and the WUWT crowd will eventually embrace using the graph ending in 2015 for as long as they possibly can. Not so sure 2016 will wind up with an anomaly at or above 1.0C. It would need to average 0.9C for the rest of the year to attain that, and it's not very likely to do that. Before the El Niño started last year, the anomaly was ~0.8C. But last year's anomaly was 0.86C, and it's a pretty safe bet 2016 will top that substantially. Wouldn't be surprised if it wound up at ~0.95C. I see WUWT made an attempt at doxxing BenBen. Keep in mind they CAN see your email address and IP address. They tried a similar thing with me a while back. I wrote a letter to Wordpress.com (who host their site) and complained about it; WUWT then redacted some of the identifying info Anthony put in one of his comments. benben touched a nerve alright. WUWT hates it when a true sceptic gets in a comment first. I just saw a comment from someone called Frank, it is very good. I know what the response will be; the usual black-is-white scientific evidence denial. I just read where Anthony "outed" benben. How pathetic is that, but the norm for Anthony. What a nasty bully. No class at all. Anthony is so brave when he's safely behind his computer screen. I bet he wishes he knew benben's name, home address and the names of his children so he could give him the full treatment. He gives Christopher Monckton a pass for calling everyone but deniers "marxist". (Just like Tim Ball and numerous other people at WUWT.) Yet Anthony stridently objects to anyone complaining about it. At the same time the bulk of his fans at WUWT call everyone who doesn't agree that climate science is a hoax a marxist. WUWT and Jo Nova (for example) are cut from the same cloth. They run Conspiracy Theory sites, make a lot of rules, break their own rules when it suits them, and give their "regulars" exemption from the rules. I would think highly of them if they just came out and stated yes we are running a Conspiracy Theory website, and allowed discussion on that topic. But no, they want to maintain their lie. Yes, recall Watts' oh-so-innocent Google Earth mapping of climate scientists' houses last month. And WUWT's strict policy of using real names and email addresses, like Hot Air, Janus100, Bloke down the pub, acementhead, ferd berple, etc. Monckton's replied to Frank. I haven't and wont read it. He turns my stomach. Amusing that at least one person used "benben" as a pejorative - not knowing of a benben stone. And yes Harry one of the resident rabbit-hole dwellers (Janice Moore) had a befuddled reply to Frank - and I replied to her. Monckton has comedy value. I suspect he does not even write his own stuff. Oh I remember that username Janice Moore - they write a lot but dodge questions. Is it time to start ignoring WUWT? When I need an opinion on non-reciprocal optics, I don't ask the minicab driver. Not to say I don't thoroughly enjoy your blog!! It really is sad that there is a whole industry that has grown up with the purpose of publishing, speaking and hosting sites that have one purpose and that is to mislead people and appeal to their more paranoid delusional viewpoint of the world. For the well adjusted in society this is not a problem however there is a subset who take the outpouring seriously. The dog whistle political statements are aimed at these people and that is not healthy for the political outcomes one would expect. As to the article above this man has a lot to answer for and is atypical of the more delusional subset in society. Should he be tolerated? Yes because his outpourings only go to undermine any credibility in the stance of his followers. Or to put it in simple terms loony people do at times give comedic moments to society. "...concealing the inconvenient truth that in the past two months global temperatures have plummeted as the el Niño comes to an end"
Lord Whatsit in post-Black Knight mode, is down to his last phantom limb. We really are dealing with not-very-nice people here. And they're all cut from the same grotesque cloth. I'm reminded of the recent RWNJ outrage over the community-funded progressive activist network GetUp! 's highly effective intervention in the federal election just passed, and Cory Bernardi's proposed creation of a 'conservative' - read 'reactionary extremist' - counterweight. As a psychologist pointed out to him, this simply won't work, because your people just aren't like that, Cory. They dignify their pathetic isolation and paranoia as 'rugged individualism' of course. That such broken people often successfully aspire to the heights of money and power, and then cynically conflate their self-interest with the 'national interest', is as succinct an explanation for the current state of the 'civilized' world as you're likely to encounter. There are a few of the more delusional within the party who wish to form a rump that will work toward " True and good policy to ensure a safe and secure country ensuring true conservative policy is put in place ". This means removing any idea of moving forward from about 1950. Yes George Cory and a few others of this opinion. Like a cancer growing on a body it needs incising however if left to fester it will take over. 1950s? Pffft. More like 1250s. These RWNJs want to turn the clock back to pre-Enlightenment or even pre-Rennaisance times, when everyone knew their place and the source of Truth was pre-ordained.